I want you to think of the pictures you have from your childhood. What pictures do you remember? Are they posed shots with generic props in a studio? Or are they candid shots your mom or dad took because you were doing something cute? I bet the pictures that truly resonate with you are the ones with a story attached. They’re the grainy photos your parents took because they were trying to capture a happy memory or a special day on film. They wanted you to remember that part of your childhood. Aren’t we adorable? Of course we are; it’s family picture day. But we do not look nearly so cute or coordinated on a daily basis. My daughter only wears a bow on Sundays, and the rest of the time she is mistaken for a boy. I do not normally dress cute AND do my hair AND do my my makeup. As cute as we are, family picture day is not real life. The problem with professional portraiture is that those pictures are usually a fictionalized account of your family. Think about it: you dress your family up in brand-new clothes, you head to a random field that you’ve never been to before and probably will never visit again, and meet up with a talented stranger who attempts to capture “the real you,” But a hired photographer isn’t going to recognize the special look your son gives his sister, or what your husband’s true smile looks like. They are just doing the best they can! Yes, the more talented the photographer the better the chances that they will capture some moments of real family connection, but that’s all they really are: disjointed moments, which may or or may not have a photoshopped head or two. What I’m trying to say is that professional family portraits rarely represent actual memories. Despite what the pictures look like, most people probably do not have a sweet memory of frolicking the field hand in hand, they just remember begging their kids to behave and please don’t get dirty. Now I am not against family pictures or professional photography. In fact, I really encourage you to take family pictures once a year, and twice if you can afford it. Professional portraiture absolutely has its place, but it should not replace the rest of the picture you–as a mother–take of your family all year long. You are a memory keeper. You know your family best: what matters to them, their funny quirks, their signature expressions, their habits that drive you crazy…. These are the things that define your family. Shouldn’t the person who knows her family best be in charge of recording those memories? 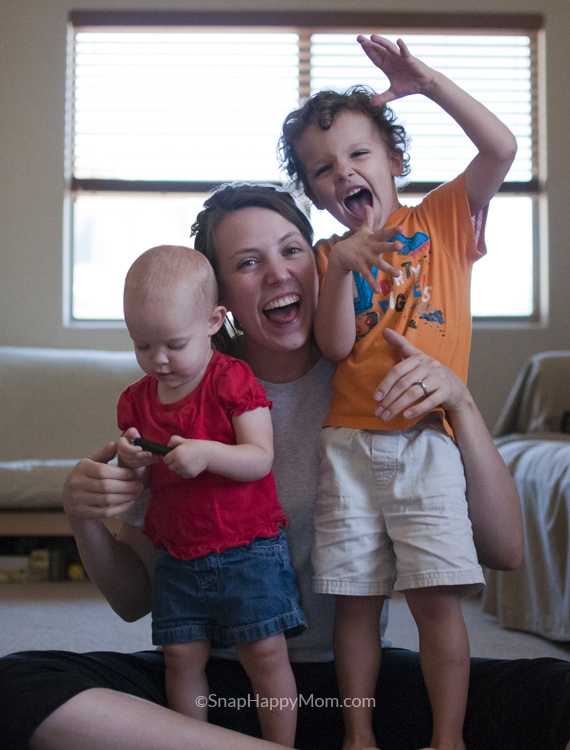 Being a mom with a camera is about capturing an accurate representation of reality. Now, your everyday life may have messy faces, non-matching clothes, an un-decorated house, piles of laundry, bad haircuts, and a less than ideal weight… But that’s your reality! Whatever your reality is, I want you to record it. 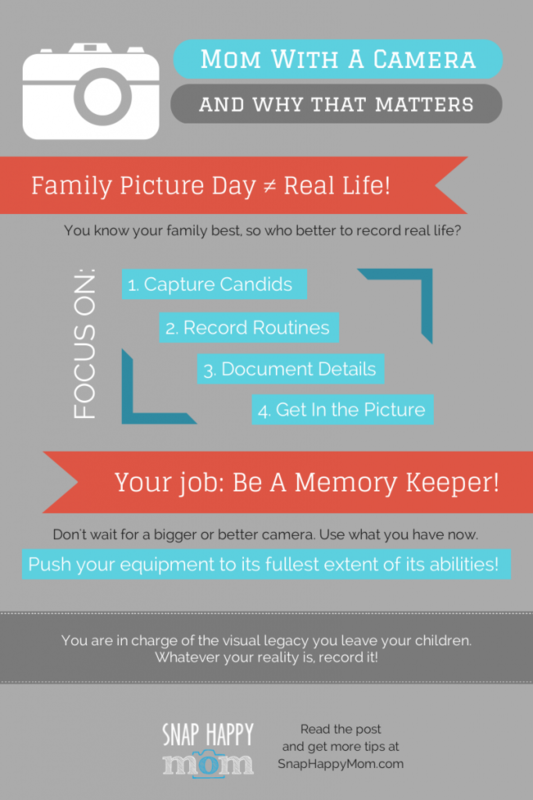 You have control over the visual legacy your leave for your children, based on the pictures you take of them now. I want my kids to be able to look back on the pictures of their childhood remember what life was really like. Stop pining after a better camera and learn how to use the equipment you already have! Push whatever you’ve got to the full extent of it’s abilities. A nicer camera does not mean nicer pictures: beautiful pictures come from photographers, not cameras. If all you have is a camera phone, learn how to take better pictures with it! If you have a waterproof case, are you taking underwater pictures in the pool? Do you use the multitude of creative apps out there to control exposure and focus? Are you playing around with colors and filters? Phone cameras certainly have a place in the world of candid, everyday photos. Do you have a compact or point & shoot camera? If you always leave that camera on automatic, then your pictures will all look the same. Have you explored everything your little camera has to offer? Do you use the scene modes and creative functions? Get off automatic and learn how to use the unique features your camera does have instead of getting frustrated with the things it cannot do. Ditching the flash and learning how to pre-focus to avoid shutter delay will vastly improve your pictures with a compact camera. If you have a DSLR and you’re using it in automatic, then the only place to go is up. You have an incredibly capable and creative tool in your hands, so learn how to use it! Take baby steps and start controlling one thing at a time. Remember that you are smarter than your camera! 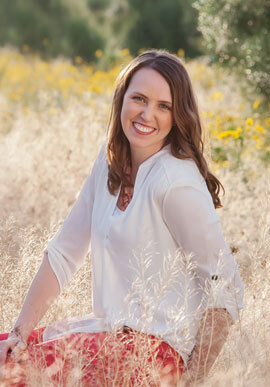 It’s ok to fall back on auto in a pinch, but if you’re unhappy with your pictures, then push that equipment! There are tons of tutorials here and all over the web to help you out. The bottom line here is do not wait to take pictures of your family until you get a nicer camera. Don’t blame the quality of your pictures on your equipment: you can always improve and progress. If you’re not happy, go learn something! I want you to focus on four things as you move forward in capturing reality as a mom with a camera. First, I want you to capture the candid moments. The only way you’re going to be able to do this is by leaving your camera out and available. You’re never going to get the picture if finding your camera is too much work (especially if it’s a DSLR that you hardly know how to use!). Yes, ever-resent phone cameras certainly help here, but if you’re trying to learn how to use a bigger camera, you’ve got to make it easy for yourself. Find your camera a home that is out of reach of small hands, but not out of sight. My camera usually lives on a high counter in the kitchen, where it’s reasonably central to the cute moments that happen all around my house. If you find yourself wishing you had a camera to capture a moment, by all means, sprint and go get it! It’s your job to record these things! Most people are pretty good at remembering the camera for the “big important” moments like birthdays and the first day of school and such. But what about the little things that make your life interesting every day? The fact that you do something on a regular schedule doesn’t make it any less important than the significant firsts. You won’t always play peek-a-boo after baths, and your daughter will not always sleep with her little bum in the air. They won’t do their hair the same way forever, or snuggle up on the couch for movies, or even be around for pizza Fridays. You need to record the things that happen every day, because someday that routine will change. What game do you kids love right now? What shoes do they always reach for at the door? Does their hair have a funny cowlick, or a lone sweet curl? Do they line up their markers in a careful row? We think we will never forget the details, the little things, that make life so sweet to us. And while you may have an excellent memory, it will be more real to your kids if there’s a picture to accompany that story. Not every picture needs to have a face, or even a person in it: take pictures of those ordinary details! 4. Mom needs to be in pictures too. Last of all, get in the picture. 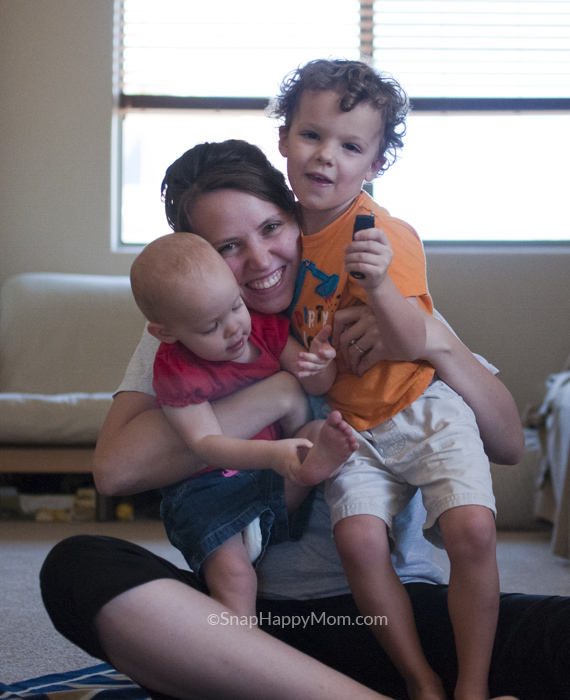 I’m a mom too, and this is an ongoing struggle for me. But I want the pictures from my camera to be a record of our entire family, not just of my kids and husband. I want my children to remember that I was there: I played with them, I was at that vacation, I helped them at home. That means I need to be in the photo. You’ll have to be purposeful about this: it isn’t just going to happen. Assign your husband or older kids to take pictures at events. When the grandparents visit let them get some pictures of you in your daily routine. Learn how to use the timer of your camera, or get a remote control. Just get in those pictures! I totally recognize that you don’t always love what you look like… you’re not the only one. But don’t let this stop you: your kids don’t care what you look like. For example, the following pictures represent a really good mom-moment. I spent the morning dancing with the kids, and I was actually present and emotionally there with them. I guarantee that I am on my second day not showering. Those are my pajamas. I don’t have make-up or hair done. And who cares? I knew I was a really good mom that day, and my kids knew it too. I don’t need this picture as proof of that, but looking at it does bring back fond memories of that time with my children. Those memories are precious, possibly even more so that a perfect, photoshopped family photo to put on the wall. 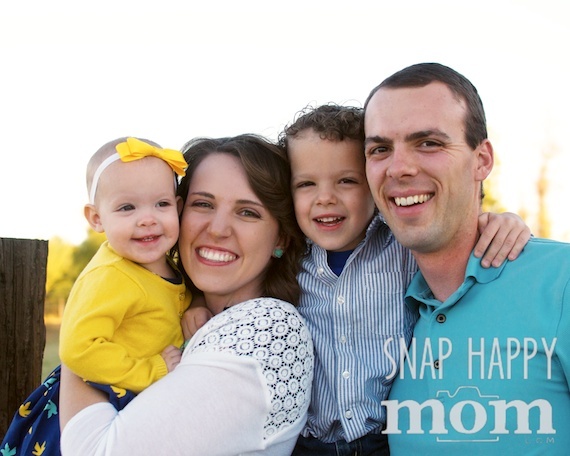 Being a mom with a camera matters! Don’t discount the importance of the pictures only you can take of your family. You know them best, so you’re the perfect person to make a true record your family life. So push your equipment, capture candids, record routines, and document details. And get in the picture! If this post resonated with you, pin this and leave me a comment! I’m the worst about remembering to take pictures. Thanks for the encouragement! Thank you for the reminders about easy ways to make sure I am taking pictures. This week, I’m going to focus (no pun intended!) on capturing candids. My smartphone takes pretty good shots so it will be easy now that I’m choosing to be intentional about it. Thank you for your encouragement! Being intentional is so important, isn’t it? I want to see some of those awesome candid shots! You are so right! Before having my son I spent a few years as a studio photographer. The picture taking dynamics are so different compared to everyday life. Most moms only wanted the “perfect” version of their families to show through. Now that I’m a mom I’ve seen the benefits of both having pictures taken by someone else and taking them myself. Having pictures of everyday life and capturing the moments that are uniquely ours is incredibly important to me. Even so I still need this reminder to keep at it. I will admit, I do enjoy taking my son for pictures a few times a year. He responds differently to others taking his pictures. I always end up with something completely different than what I can capture of him. I do tell the photographer that I don’t mind silly expressions in his pictures. That’s just the real him shining through. You’re right, there are definitely benefits to having BOTH kinds of shots. It’s nice to have a “perfect” shot of the whole family, but I love the stories that all the other pictures can tell too. So glad you’re making it a priority to capture both! I L.O.V.E.D. reading this! My husband and I own a photography business. I am just recently getting out from behind the desk so that I can be behind the camera. I have found it much easier to remember to take photos when I leave my camera out. Writing my own blog has also encouraged me to always be looking for those shots. I have been getting a lot of the details and routines. Like a picture of my toddler’s moccasin slippers that she wears EVERYWHERE and insists on leaving right next to her bed. I am looking forward to reading more of your blog! I love love love this post. I thought I had the only family that didn’t frolick in the fields! A photographer has a tough job to capture the essence of the loved ones that we see every day. As for the bows in the hair… a photographer has never captured a pic of mine with a bow or any other thing that made their hair look smart. I think they will look back on their childhood photos and think they were dragged through a hedge backwards! Sarah, you are definitely not the only one! Lots of people feel that way: choosing outfits and getting ready really stresses people out, so by the time they are actually taking pictures you can feel the tension. It’s certainly not an easy job. I love it when I am around the moms that remember to bring their cameras because then I get pictures too. But I must say, that I’m not to shabby when it comes to grabbing the phone and snapping a candid when the kids have done something cute or are just being themselves. I need to get better at getting Mom in the photos though. Great post. I try to remember to take my camera wherever we go. It’s the only way I can get natural pics of my kids. Thanks for the tip on learning to use the camera you have. I have a point and shoot, but have been hoping for a better one. I am going to dig out my instruction manual and see what my current camera will do. This is a great article, and I might add – do something with your pictures. I know lots of people who just store them on their computers. We have lots of scrapbooks and photo books in our home. My children love to go through these and review all the memories they hold. This is so true, thanks for bringing it up! If we put all this effort into capturing beautiful memories, then we should really make those memories accessible, right? I’m just as guilty of this as the next person, but I’m working on it! I’m always on the lookout for people who love their photo book publisher; where do you get yous printed? I did have several books done through Creative Memories, but at the moment they’re not doing books. I’ve had a book done at Black’s Photo Store – but that may be in Canada only. I think Panstoria would do a good job. They’re an online scrapbooking company. I guess I would read reviews and make a decision from there because there are quite a few choices online to order books. I liked being able to go into our local store and actually handle samples of books. I love this. I capture everything with my cell phone. I have a new Windows phone and the camera is top notch. We have a tripod, so if we want to set up a family photo we can. But usually it is just us, snapping pictures at each other and our beautiful surroundings here in Alaska. Wonderful advice. I now have a teen and I’ve discovered that I’m in one out of 100 photos. So, we’ve been taking quick selfies before events to try and prove that I’m there. Great post. It becomes a little disheartening looking at everyone’s pictures online on blogs these days. Everything is so perfectly styled and I just can’t bother with all that effort most of the time! You make such important points. When my kids were little, I was the photographer and I am missing from most of the events, hiding behind the camera! The point you made about photographers take pictures, not cameras is the complete truth! I am a bit of a shutterbug myself. Whether it is a pic of the hubster doing something randomly hilarious or the cats/dogs being silly, I find that is the best time to start snapping shots. Quirkiness is just fun! You are so right that the staged portraits are nice, but not memorable. Awesome post! I love those pictures of you with your kiddos! For me, it is important to have both professional pictures and day to day pictures. Because I used to scrapbook (and plan to continue if I ever find the time), I am actually really good at capturing our daily memories. I do need to learn more about my camera, though, as you said! A great post – and beautiful pictures. My husband generally takes the camera out every weekend. But we need to make more effort to get Mum and Dad in pictures – and record our regular routine. I forgot to add I love what you said about making sure Mom gets in front of the camera instead of just staying behind the camera. Great post! I really love your tips and I did share it across the social media board! My favorite tip was for us moms to also get in the picture! My husband tells me this all the time, that he wants to have pictures of me as well! (I am very un-photogenic though!) I will make a point to get in some of those shots from now on! Thank you for taking the time to write such a good post! As for professional pics – I so much prefer the everyday snaps I take of my kids and family – doing all those things which make us “us”. Excellent post! I take quite a bit of pictures, even last night with my new smartphone. I love taking the candid or semi-posed pictures. I don’t like taking pic of myself but I know my kids would love to have some of me when I pass on. Love your post and suggestions. I am the memory keeper for my immediate family..I am always snapping photos of special outings and moments. I have a digital camera, and just learned that I can take all sorts of pictures using a multi-function timer feature that I didn’t even know existed. I love taking pics and my family loves going through my camera because I have YEARS of memories that they had no clue I’ve been taking pictures of. My brother loves it..I’ve basically have a chronicle of my nephew’s life in there. I’m a picture happy mom! I take so many pics! I just got a Canon Rebel T3 and I am so excited to learn how to use it. I will be checking out all your tutorials!! Loved the sentiment of this article, I think that we all lean on the crutch of “equipment” when really we just need to let go and enjoy the process of getting better at something. It happens a lot in areas where any equipment is involved (sports like golf, blogging, photography, etc.) because it’s easier to buy something new. After having kids, I’ve realized that it’s the memory capturing that matters, not the resolution of the photo or anything silly like that. My iphone’s memory is about 99% photos of our kids doing silly things. I love your candid photos with your kids. They truly put a smile on my face. Those kinds of pictures are what family is all about. I love all the random photos my mom took of me when I was little. They are great to look back on! I love this! My most favorite photos are candid, for the most part. We have never had a “real” family portrait done because it’s just not real life. You make me want to take more pictures. Thank you! Almost all of the photos of my childhood were lost in a fire, so I have always been big on taking lots of pictures of my kids. I love your suggestions. Great advice! I hadn’t considered myself to be a memory keeper. That’s an important job! I do a good job when we are on vacation, but I need to be more diligent during ordinary times, too. Thanks for the reminder! Wow, so right about the fact that the pictures that stay with you the most are the one’s that capture candid moments! Definitely what came to mind when I reflected. I also really, really agree with the idea of keeping mom in the photo. We take so many photos when we are out and about and I notice that most of the time I shy away from being included because I’m not “photo ready”. Of course then most of our photos aren’t truly representative of who spends most time with baby. One of my goals is to try to stay in the pictures, to at least have those memories with me. Thanks for sharing! What a great reminder. I love that digital cameras let you take as many pictures without having to worry about “wasting film” like the old days! I love capturing those little moments, though I would love to learn how to take more artistic photos. I love your pictures!! Super helpful post. I love capturing photos and memories. I think I will make a camera a diaper bag necessity. Now if we could only find a good way to share them all instead of having to post all on fb and such. I’m open for ideas. I would just check amazon for “wireless shutter release” or “remote” and your camera model number. The D60 looks like it just takes the simple remote from Nikon with a shutter button, or the off-brand version of it. I invested in a more complicated remote that has a multi-click feature that I like, but the simple one with work.